"I first met Sir John Fowler 40 years ago ... the impression I then formed of him is as clear today as ever, and has never varied. I felt myself in the presence of a born commander of men, who formed his opinion with instinctive quickness, held on to it firmly, never questioning its soundness himself, nor failing sooner or later to satisfy most of his hearers by ingenuity of argument and charm of manner, that if they held a contrary opinion originally it was a fortunate thing for them that they had come to see him before it was too late." John Fowler (1817-1898) was 23 years older than Baker. He had been a successful engineer from a notably early age — he built his first railway at only 23 years' old. He quickly rose up through the ranks of the new and booming profession of civil engineering. Fowler was a contemporary and friend of Isambard Kingdom Brunel (1806-1859), Joseph Locke (1805-1860) and Robert Stephenson (1803-1859), holding regular Tuesday evening dinner parties at his London home in Queen Square Place. As mentioned earlier, Baker met Fowler when he was working for William Wilson (1822-1898) and under Wilson, Baker contributed to the success of Fowler's work on the first Victoria (Grosvenor) Rail Bridge (1860, now demolished) across the Thames. Fowler was a very good spotter of young talent and good at putting together effective teams: Baker joined his staff in 1862. When the younger engineer felt restless in England, Fowler persuaded him not to move to the Colonies, which seemed so full of opportunity, but to stay and pursue his career. Luckily for Baker, Fowler's good judgement led to an impressively global career, catching as it did, the moment in time when the British Empire was at its height and technology matched it's might. Recognising Baker's talent, Fowler made him chief assistant in 1869, junior partner in 1870 and full partner in 1875. Their appreciation of each others' qualities is evident in Baker's words on Fowler and his own progression through the company Fowler founded. Fowler was also an appealingly avuncular figure to Baker, who had lost his father by the age of eleven. After 1867, they worked out of offices in Thornwood Lodge, Campden Hill in Kensington, London. 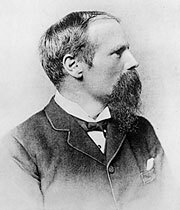 Baker's and Fowler's professional careers remained closely linked, and Baker largely took over the practice when Fowler died in November 1898. Before then, they would work together on many significant projects, including the world's first underground railway system — London Underground — and the world's longest bridge at the time — the iconic Forth Rail Bridge (1882-1890), which was also the largest cantilever span and the first large-scale use of steel in bridges. In London, both Baker and Fowler acted as consulting engineers for the earliest underground railway that used 'tube'-style tunnels, the then-named City & South London Railway, now part of the Northern Line. The firm's expertise in this kind of work led to similar projects overseas, including Baker's consultancy on New York's Hudson River Tunnel. It was while acting as Fowler's assistant that Baker began his connection with Egypt and he went on to play a significant part in that country's development. Baker and Fowler also consulted for the New South Wales (Australia) government on railways, and Baker consulted for the Public Works Department of the Cape Colony. Indeed, Baker's long connection with various British Colonies and Dependencies would lead to official recognition and the awarding of the KCMG. 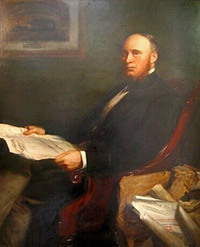 Portrait of Sir John Fowler. Baker began working for Fowler in 1862, rising up through the firm to partnership in 1875. Their careers were closely tied, though Fowler was 23 years the senior.